Signs of Past Life on Mars? Washington, DC - Ever since scientists learned that water once flowed on Mars, they've wondered whether life might also have flourished on the apparently now-dead planet. In the 16 August issue of Science, McKay et al. report the first identification of organic compounds in a Martian meteorite. The authors further suggest that these compounds, in conjunction with other mineralogical features observed in the rock, may be evidence of ancient Martian microorganisms. The paper's authors are David S. McKay and Everett K. Gibson, Jr., of NASA's Johnson Space Center in Houston, TX; Kathie L. Thomas-Keprta of Lockheed Martin in Houston, TX; Hojatollah Vali of McGill University in Montreal, Quebec; Christopher S. Romanek of the University of Georgia's Savannah River Ecology Laboratory in Aiken, SC; and Simon J. Clemett, Xavier D.F. Chillier, Claude R. Maechling, and Richard N. Zare of Stanford University in Stanford, CA. About 15 million years ago, a major asteroid impact on Mars threw ALH84001 into space, and about 13,000 years ago it fell onto an ice field in Antarctica. 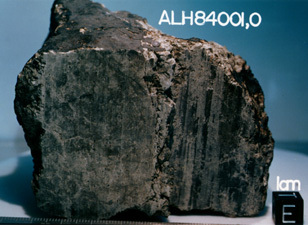 ALH84001, which shows little evidence of terrestrial weathering, was discovered by meteorite-hunting scientists in 1984 and only recently identified as Martian. ALH84001 is riven with tiny fractures resulting primarily from impacts that occurred while the rock was on Mars. The secondary carbonates formed along with some of these fractures. The Science authors prepared thin sample sections that included these pre-existing fractures, and found on their surfaces a clear and distinct distribution of polycyclic aromatic hydrocarbons (PAHs), organic molecules containing multiple connected rings of carbon atoms - the first organic molecules ever seen in a Martian rock. A variety of contamination checks and control experiments indicated that the organic material was indigenous to the rock and was not the result of terrestrial contamination. For example, the authors noted that the concentration of PAHs increases inward, whereas terrestrial contamination likely would have resulted in more PAHs on the exterior of the rock. The big question is: where did the PAHs come from? It is thought that PAHs can form one of two ways: nonbiologi-cally, during early star formation; or biologically, through the activity of bacteria or other living organisms, or their degradation (fossilization). On Earth, PAHs are abundant as fossil molecules in ancient sedimentary rocks, coal and petroleum, the result of chemical changes that occurred to the remains of dead marine plankton and early plant life. They also occur during partial combustion, such as when a candle burns or food is grilled. The higher concentrations of PAHs were found associated with the carbonates. The carbonates formed within the rock fissures, about 3.6 billion years ago, and are younger than the rock itself. The magnetite and iron-sulfide particles inside the carbonate globules are chemically, structurally, and morphologically similar to magnetosome particles produced by bacteria on Earth. High-resolution scanning electron microscopy revealed on the surface of the carbonates small (100 nm) ovoids and elongated features. Similar textures have been found on the surface of calcite concretions grown from Pleistocene groundwater in southern Italy, which have been interpreted as representing nanobacteria. Some earlier reports had suggested that the temperature at which the ALH84001 carbonates formed was as high as 700 degrees C - much too hot for any kind of life. However, the isotopic composition of the carbonates, and the new data on the magnetite and iron-sulfide particles, imply a temperature range of 0 to 80 degrees C, cool enough for life. The magnetite - a mineral which contains some ferric (Fe3+) iron, perhaps indicating formation by oxidation (the addition of oxygen) - and iron sulfide - a mineral that can be formed by reduction (the loss of oxygen) - were found in close proximity in the Martian meteorite. On Earth, closely associated mineralogical features involving both oxidation and reduction are characteristic of biological activity. On to the next article, Microrover Ready to Roll! To find out more about the Mars meteorites, go the Mars Meteorite Home Page!